It’s been three years since I last attempted Billy’s Epic Training Loop, but with less than a week before my race in Tasmania and a forecast for beautiful weather, I figured today was the perfect time to do it again. After a 5am wake up call, I locked my kayak at the Loma boat ramp and started riding from Westwater at 8:15am. Although it was a little chilly to start, the morning was gorgeous with clear blue skies. I rode for almost two hours to Rabbit Valley before seeing anyone. The peacefulness continued all the way to Salt Creek where I saw five guys climbing up from Troy Built. Salt Creek is a gnarly descent and these guys looked like they had felt every foot of technical elevation gain. I think they were more surprised to see me coming down than I was to see them. 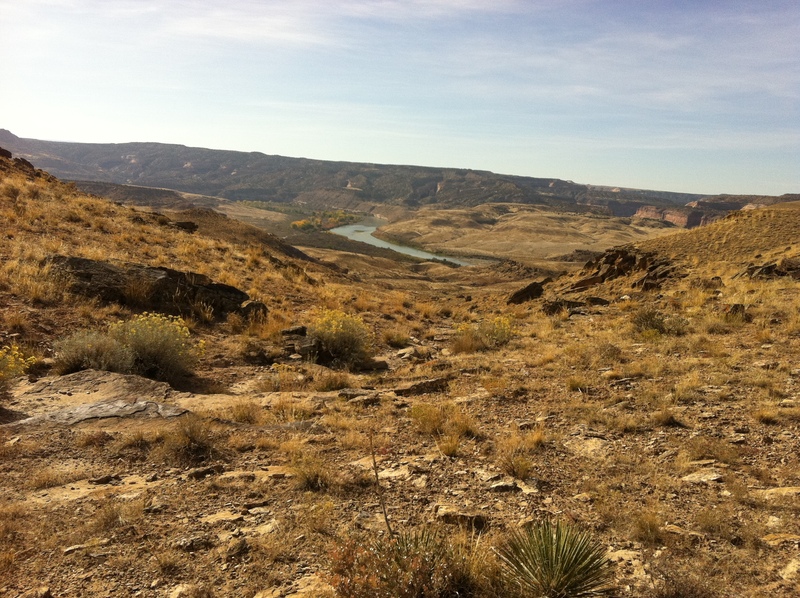 About to head down Salt Creek overlooking the Colorado. I finished up my 40 mile ride to Loma in 3 hours and 40 minutes (5 minutes faster than last time) and then quickly transitioned for 25 miles of paddling back to Westwater. Before I knew it, I had paddled 11 miles and was feeling good. At about hour three, I noticed I slowed a little bit and was ready to be done. I pulled up to the boat ramp after exactly 3 hours and 40 minutes of paddling – the exact same time as my biking leg. Weird. Although I felt a bit slow for the last five miles, I still managed to drop 20 minutes off my paddling time from three years ago. I made it home in time for dinner with kids and Juniper was excited to tell me that she rode her bike a long way today as well – six miles all the way down the bike path to the Harvest Festival at Rock Bottom Ranch. She was so proud. I love it when an awesome day just gets better when I return home.